Dr Surabhi Jain is a celebrity nutritionist and health professional with more than a decade of progressive experience in the sector. Dr.Surabhi is a doctor by training who later, went on to pursue a Masters’ in Business Administration and post-graduation in nutrition from the esteemed Public Health Foundation of India and M.Sc. (Nutrition). In the earlier part of her career, as a public health professional, she worked extensively in maternal, child health and nutrition. Her earlier public health stints with professional bodies, government and NGO’s like FHI, UNICEF , HLFPPT, GOI, MOHFW etc. became the drivers of her passion to finding organic and non-medicalized solutions to health issues. She is the Founder of “NUTRIWELL INDIA”, one of the leading consultancies in Nutrition and Lifestyle Management. 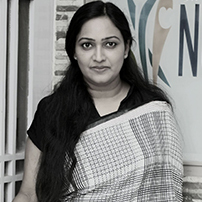 She has been the guiding force for team NUTRIWELL INDIA to provide context based, nutrition and dietary solutions for health problems.In partnership with corporates and NGOs, she has led numerous workshops and knowledge sharing sessions. Even to date, with innumerable success stories and testimonials to her account, she drives her passion to give indivualized, patient centric care. For Nutriwell’s invaluable contribution to the field of Health, It was awarded the “EXCELLENCE IN HEALTH CARE” by the World Health Leadership Congress in 2016. Dr Surabhi Jain is also FEMINA , WWLC SUPER WOMEN ACHIEVER 17 in the health sector. For more on her, she has been a regular feature on the female show “SANGINI”, “Meri Saheli ” ETV She is Nominated for Excellence in Health care by FICCI FLO ( Uttar Pradesh Chapter). She is chosen among the few women Entrepreneur who are Mentors in Prestigious WE CAN Program by Cherie Blair foundation and US Embassy with DRITI for Woman Empowerment. She has been recognized for her contribution to health care by CWF and Leading Media Group Hindustan Times. She was awarded the prestigious ‘Shining Star’17’ Title from Women in work and Barclay’s for Most promising Diet Consultancy. Dr Surabhi , Is the only Nutritionist from the field of medicine who has worked extensively in Poly cystic ovarian syndrome Nutrition Planning. Her research papers are published in various Journals.